Last night I ventured downtown to the St. Lawrence Centre for the Arts for the final public all candidates debate for Toronto-Centre ahead of the March 17th by-elections. The theme was the role of the federal government in improving city life, although it didn’t stick to that theme in the Q&A. In attendance were the NDP’s El-Farouk Khaki, the Conservatives’ Don Meredith, the Liberals’ Bob Rae and the Green Party’s Chris Tindal. The theatre was pretty full, the lobby overflowing and the crowd boisterous. It was my first time experiencing an all candidates meeting in an urban riding, and I must say it was a larger scale than in my rural experiences. Lots of non-related pamphleteers out front. I thought Bob Rae did well. His political experience certainly showed, and he looked very relaxed on the stage. I was pleased to see he didn’t run away from Stephane Dion, but mentioned his name multiple times in his opening statement and regularly throughout the evening. I liked his point about the real fiscal imbalance being between the federal government and the municipalities, and his comment about making transfers to the cities incentive-based to reward green investment. I was also pleased to hear him support a call for a green tax shift, something not currently in Liberal policy but that he hinted may soon be. And since he’s co-chair of the platform committee it’s probably a safe bet. He also called for control of the Toronto port authority, including Island Airport, to be given to the city. CPC candidate Don Merideth had a tough go of it. I almost feel bad for him, because he seems like a decent guy, and I don’t think he’s personally too far apart from most of the people in the room on many issues. Unfortunately he’s forced to sell a party with very different views, and people just weren’t buying. He said again and again the Conservatives are investing in and are committed to social housing and fighting poverty. People laughed. On safer ground talking crime, he said Liberals stood idly by in 2005 while “blood ran on our streets” and was booed down for the disgusting comment. On a foreign policy question, he mixed-up Afghanistan and Iraq not once, not twice, but at least thrice, talking about how our Liberal-inherited mission in Iraq was so important, ignoring the increasingly loud yells of Afghanistan! until the moderator stepped in. He said no to a carbon tax. I will give him credit for distancing himself from Jim Flaherty’s Ontario bashing. Ontario is not the 5th province, he said, and Toronto is the economic engine of the country. The NDP’s candidate, El-Farouk Khaki, didn’t impress me. When he wasn’t on script I liked some of what he had to say, but he seemed uncomfortable and very scripted. He kept harping on leadership, whether it fit the context or not, it was his answer to nearly everything. And I wasn’t impressed at all at the vocal NDPers in the audience who tried to shout-down Bob Rae with calls of Traitor! a number of times as he tried to speak. Not classy at all. Along with Rae I’d say the most comfortable and at ease candidate on the stage was the Green Party’s Chris Tindal. He has the only candidate to have ran in the riding previously so that probably helped and, as he joked, allowed him to claim a kind of incumbency. He almost seemed to be doing a little stand-up comedy at times. But he also got some of the loudest ovations, and showed a strong grasp of issues green and non-green. I liked some of his comments around fair trade, for example, although we disagree on Afghanistan. He also got in some good shots at some of the other candidates. He rightly called Meredith out for trying to pass off a dollar figure that included highways funding as being all for transit. And, pointing out how it was nice Rae was calling for a green tax shift, that’s not Liberal policy today and if you want a green tax shift maybe you should vote for one that supports it today. Even Rae said Tindal is the candidate on the stage that he most respects, and the only one of his opponents to run a campaign on ideas and issues. This is a by-election, and I think Tindal may have scored when he said if we elect a Green we’ll make history, and if you don’t like me you can vote me out in another month, week, or whenever the next election is. I hear he has a lot of volunteers, and has raised more money than the NDP. Given the level of support he had in the room, I wonder how many people in the room may be planning a Green protest vote. Particularly Liberal supporters. It’s a pretty safe bet Rae will take this thing, even Meredith said it would “be a miracle” if he won. Given that it’s likely to be a Liberal win anyway, and given that Rae has been one of the anti-election leaders, I wonder how many Liberals might decide the way to send a message to the leadership is with a Green protest vote? Might be something to watch next Monday. If you read the last issue of NOW magazine, you also realize that neither Jack nor Olivia have made a presence in Toronto Centre. A bit odd. How will they spin a third place finish? We also agreed that El-Farouk did not seem comfortable. Someone who I was with knew from his immigration/refugee work and said he is much more comfortable defending his clients, which I hope he would be because last night he did not seem comfortable at all on stage. I was surprised by his poor performance. I also thought he went a little far in his comments on Afghanistan saying we are propping up one warload while fighting another, not in such a nice way. I thought Bob did well. He was definitely relaxed on stage and I know that many people say you shouldn't use props during a debate I thought his showing of the campaign literature from the NDP and Conservative Party quite interesting. Even from my seat near the front I could see that Dion's face was distorted on the NDP pamphlet. Shame really. As for Meredith, I was impressed too and definitely would not want to have been in his spot. I thought the real highlight of the night was the guy from the Canadian Action Party. It was nice comic relief. Oh and for the hecklers. 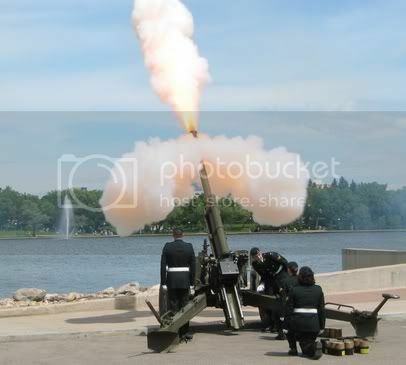 I wasn't impressed at all by the NDP hecklers. Give it up already and it's a bit ridiculous seeing as they parade around Thomas Mulcair and make a point he was a former provincial Liberal. Also, I'm fairly certain one of the hecklers was Cheri DiNovo, MPP for Parkdale-High Park. I guess it must have been a quiet day at Queen's Park. Queen's Park does not sit until March 17. I am not sure if Rae actually voted for DiNovo in the by-election. Maybe this may be the reason she heckled the loudest. Mushroom... "If you read the last issue of NOW magazine, you also realize that neither Jack nor Olivia have made a presence in Toronto Centre. A bit odd." That information is just simply wrong. Olivia has constantly been in the riding, knocking on doors, attending events and even stepping in for Mr. Khaki at an all-Canadiates meeting when he couldn't attended due to an accident. Off the top of my head, I can think of at least 5 events that she's been in the riding for. On top of that, Thomas Mulcair has been there, Libby Davies was there on this last weekend, Peter Taubuns has been canvissing just about every weekend, Cheri DiNovo as well, along with Marilyn Churley. The NDP is not going to finish any worse than 2nd in this riding, and El-Farouk Khaki is the only other candidate that can win this race. Tindal is doing a decent job, but he is taking the majority of his votes from the Conservatives. If you want to watch a story here, it will be the Conservatives tanking to 4th. Rae voted Liberal in the by election. He was out campaigning for Sylvia Watson at the subway stops a couple of times. Which of course prompted the NDP to claim that Watson was in trouble because they had to recruit Rae (& Gerard Kennedy) to campaign. They conveniently overlooked the fact that Jack Layton was going to campaign the next day for DiNovo.... Not that I want to rehash that byelection fiasco. I was reading Chris Tindal's blog and I was curious if you took note of the little disagreement between him and Rae on whether or not Canada has soldiers in Iraq. Because he's quite right - there aren't many, but they are there and Bob really should have known that. Don Meredith is just wasting time and money. Toronto-Centre has within its borders the Gay Village and a former (or current?) pastor saying he would respect the gay "lifestyle" seriously doesn't care to be elected. I wasn't impressed with my first run in with El-Farouk Khaki. For some reason trolloping around with buddies during an election campaign does not make you look professional or respectable. He also seems way to inexperienced as evident from what I mentioned. I like Chris Tindal. 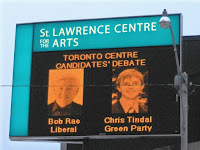 If it weren't for Bob Rae running, he'd have my vote. Its my understanding that what troops are in Iraq are there because they chose to and not on a government sanctioned mission. Private contracts only. Is that what you are referring to or am I out of the loop? I know Chris Tindal, and he belongs in Parliament. Period. Jeff, you may get a laugh here: Tindal is one of my Crookes co-defendants. Look for Tindal's excellent piece "The Silliness of Suing a Wiki" which is what Crookes sued over. Yeah, Rae is a good parliamentarian, and as a card-carrying Liberal, I guess I should support him, but... if I lived in Toronto-Centre, I would have a very hard time not voting for Chris. I see Cam beat me to it, but I was going to say I know Olivia filled in for El-Farouk at at least one all-candidate's meeting when, I believe, he was ill. I don't know how active Jack has been in the riding. Since it's next door to his, I'd hope fairly. Bailey, that's funny about Chris' parents, I think Bob's wife was in the row over from me. The pamphlet thing was good, I have them, I plan to scan them and do a post. I'll leave my comments on them for that post. Speaking of pamphlets, the Canadian Action Party guy's was as hilarious as his speech, although his this debate is useless line was great. Cam, we'll see, can Chris pull a Elizabeth May/London byelection and finish 2nd? It's a longshot, but you never know. Anyway, I agree pushing the Cons down to 4th would be sweet. Jennifer, I did take note of that and I knew right away Bob was wrong on that score. I didn't mention it in this entry because I wanted to wait to do some research and get the names, I see Chris has beat me too it. As he writes, it's curious as foreign affairs critic Bob would be so emphatically unaware. Jay, a handful of Canadian officers are or have been in Iraq through their participation in exchange programs with the U.S. military. Canadian officers are posted to U.S. units through an exchange program to gain experience, and if those units get deployed to Iraq, they go too. That's what Chris was referring to. If Chris doesn't get at least 20%, that pretty much confirms that democracy is dead there. I'm not sure why you say what you do about Rae being wrong about what he said about Canadian soldiers being in Iraq. Exchanges between militaries to enable soldiers to gain experience happen all the time and have done so for decades. When I read Tindal's comments I thought he was saying that the government had sneakily sent Canadian soldiers to fight in Iraq. That's not what exchanges are. Cara, I don't think Chris made any such implication about the government sneakily sending soldiers to Iraq. He was merely pointing out that the fact of their role does make the war in Iraq relevant to Canadians. So not a positive article for you guys. A prominent Liberal not associated with Gerard in any way told me that Rae voted for Peggy Nash before he became a Grit. So the links between Rae and DiNovo was assumed on my part. Thus, I "misremembered". One thing about blogging is that the blogger needs to get the facts straight. I try to be more journalistic in my comments, but sometimes I do miss a few facts. Of course, it is not easy when you try to reveal "mushroom" knowledge into the blogosphere.